Audience members (6 per show) experience Reassembled, Slightly Askew individually, listening to the audio via headphones while lying on hospital beds. 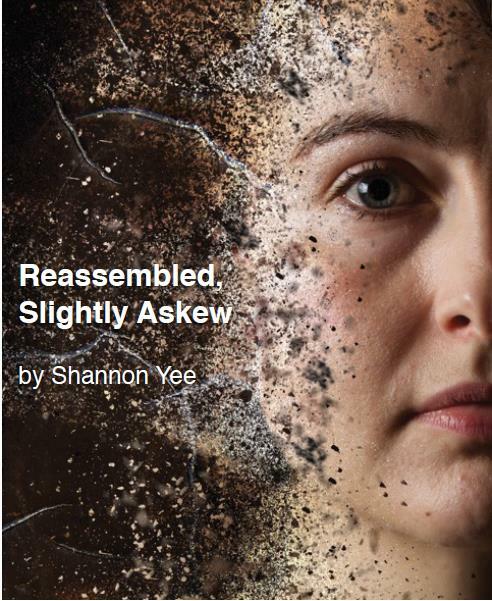 The audio technology makes the sound three-dimensional, causing listeners to feel they are inside Shannon’s head, viscerally experiencing her descent into coma, brain surgeries, early days in the hospital and reintegration into the world with a hidden disability. A life-affirming story of terror, discovery, humour, and above all, hope. On Sat 11 March Shannon "in-conversation" about her work, this will take place between the 2pm and 4.15pm shows, approx 3.30pm. Ask at the desk of the museum for the location in the building. On Sun 12 March 10am-11.30 Shannon will be leading a writers' workshop. Please email talk@jumpeduptheatre.com to pre-book and for more info. Booking via Eastern Angles. Book on-line via the link at the top of this page, or call the box office 01473 211498 (10am-2pm, Mon-Fri). Early bird discount applied on checkout. NB Only 9 performances. Only 6 tickets per performance. Please note: latecomers cannot be admitted. Information about access for people with physical, sensory or learning disabilities is available here.